If Pruitt had stood by his own scientists, the chlorpyrifos ban could have taken practical effect next year, but now the EPA won’t reevaluate its safety until 2022. Based on data from the U.S. Geological Survey, the delay means roughly 30 million pounds of the weed-killer will be sprayed on cropland throughout the country in the next five years. 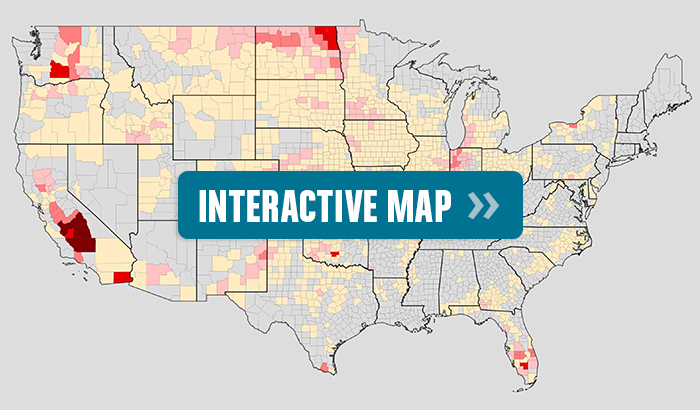 How much chlorpyrifos is sprayed in your region? Find out with EWG’s interactive map. The evidence is overwhelming that even small doses of chlorpyrifos can damage parts of the brain that control language, memory, behavior and emotion. Multiple independent studies have documented that exposure to chlorpyrifos impairs children's IQs. EPA scientists' assessments of those studies concluded that levels of the pesticide currently found on food and in drinking water are unsafe. Jan. 17: Dow Chemical, which manufactures chlorpyrifos, files a petition with the EPA, calling on the agency to reject the ban on the pesticide. Jan. 20: President Trump takes office, celebrating with inaugural balls for which Dow contributed $1 million. Feb. 17: Pruitt is confirmed by the Senate as EPA administrator, despite evidence of his ties to the industries he will regulate. March 1: According to documents obtained by The New York Times, the Washington State Farm Bureau meets with the EPA, pressing for cancellation of the proposed ban, on which the agency was supposed to decide by March 31. Pruitt tells the group it’s “a new day, a new future” for the relationship between chemical agriculture and the EPA. March 9: Pruitt meets privately with Dow’s CEO at a Houston hotel. March 29: Pruitt signs an order cancelling the proposed ban. The EPA’s own calculations suggest that babies, children and pregnant women all eat much more chlorpyrifos than is safe. The EPA estimates that typical exposure for babies is five times higher than what the agency considers safe. For toddlers and older children, exposure is 11 to 15 times what is considered safe, and for pregnant women, five times higher than necessary to protect the developing fetus. The American Academy of Pediatrics urged Pruitt to reconsider his action and proceed with the ban. But Pruitt didn’t take the advice of 60,000 doctors serving babies and children. Chlorpyrifos poses an extra risk to farmworkers and their families, and people living near agricultural fields. Data from California, the only state that tracks pesticide use in detail, shows that in 2010 alone more than 7,700 pounds of chlorpyrifos were sprayed within a quarter-mile of schools in the state. Just over a month after Pruitt’s reversal of the proposed ban, more than 50 California farmworkers were exposed to chlorpyrifos that drifted from a nearby field, with at least 12 reporting nausea, vomiting and fainting. According to data from the U.S. Geological Survey, roughly 6 million pounds of chlorpyrifos were applied to farm fields in 2015. 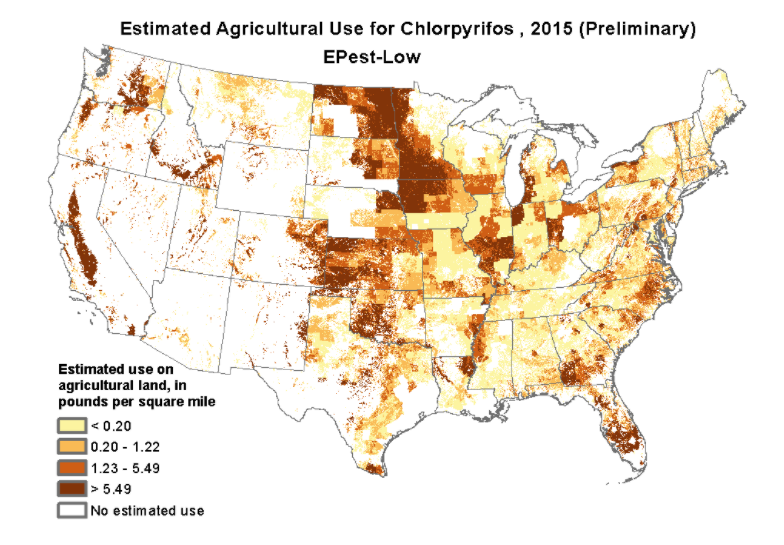 Use of chlorpyrifos is heaviest in areas dominated by agriculture, including California, the Northwest and the Midwest. It is applied on grapes; on tree fruits such as apples, nectarines, peaches, citrus and almonds; and on corn, wheat and soybeans. Researchers with the U.S. Department of Agriculture, which tests produce for pesticide residues each year, estimate that almost half of conventionally grown apples are sprayed with the pesticide. Americans are also exposed to chlorpyrifos residues on imported produce. Even when the EPA bans a pesticide it does not disappear from agribusiness’ chemical toolbox overnight. A phaseout can take years. If Pruitt had implemented the ban in 2017, the amount of chlorpyrifos being used in conventional agriculture likely would have started to decline this year and continued to shrink in the coming years. Instead, we can expect to see at least 6 million pounds of chlorpyrifos sprayed each year until the EPA reevaluates the pesticide’s safety in 2022. Dow Chemical and agribusiness may celebrate Pruitt’s decision today. But all Americans who want to eat food free of a chemical that can permanently harm children’s brains should be outraged by this anniversary.